Usually, when we surf some online video sites and watch a video that embed on a web page, like Youtube. If somebody like use external media player to play it how can you do? It is possible to use a Firefox add-on. 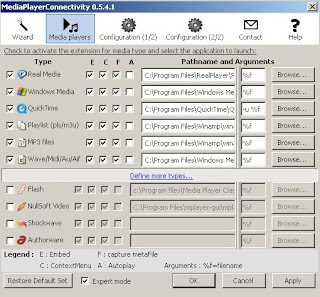 MediaPlayerConnectivity is a Firefox add-on, it allows you to launch embed video of website in an external media player with a simple click, like Windows Media Player, Real Player, Quick Time, or other players. After you installed this add-on you can associate them with various media formats. So next time, when you surf a video site just a click you can use your favorite media player to watch online video. It is simple and quick.